I have been using Fastcap Safety glasses with 2.0 bifocal lenses in the shop. They have served me well and more than ever I need the bi-focal boost to see the close-up stuff better. Recently the nose piece on the Fastcap split and became un-repairable (I think this is no longer an issue on the newer version.) But when I checked Amazon I also found these Crews Bearcat glasses with 2.o bifocal for half the price (under $5) as long I as I included them with some other purchase. They are made by MCR Safety. I decided to give it a shot. Custom width edge protectors made with blue painters tape and plasti-dip. See it on Popular Woodworking A variation on this is to use mold-able silicon like Sugru. CONS: You are stuck with the size and shapes in the set. Investing in tools that carry a lifetime warranty can be a good way to protect your investment and as a result, remain frugal. The problem I have run into on occasion is that the brand name that carries the guarantee sometimes gets warn off or falls off the tool with use. When this happens it becomes difficult to exchange it for a replacement tool if it breaks. It becomes worthwhile to protect that label or other markings in order to protect your investment. A couple of quick coats of shellac over the handle and label, protect the brand on the label and protect the warranty. Be proactive. Take a digital photo of the tool while it still has the branding on it. Save it on your computer in a folder dedicated to your tools. This also helps if you ever need to file an insurance claim. 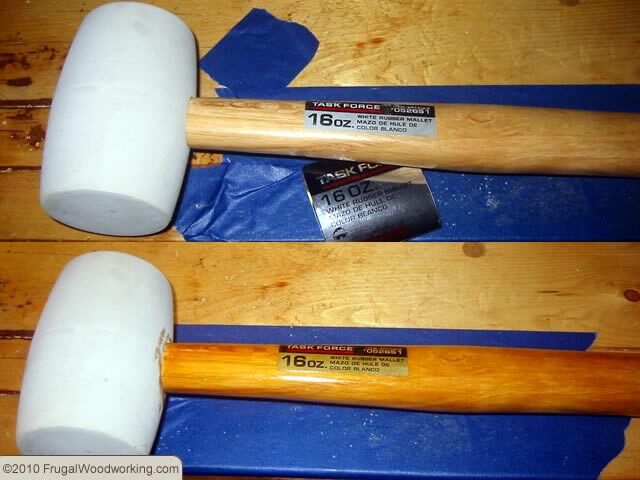 If the brand name is printed or painted on a tool’s wooden handle, put a coat or two of polyurethane over it. Use spar polyurethane if they are outdoor tools. This will help keep the branding from getting warn off. Shellac can be used for indoor tools if you prefer. If the name is etched into the metal, then just keep the area protected from rust. A file folder in the workshop for receipts can also help. One of the basic ideas behind being a frugal woodworker is to protect your investment in the tools you already have. Oil on tools, paste wax on table saw tops, and now, plastic bags over calculators. I have a calculator I keep in the shop and to keep sawdust and grimy hands from shortening its life, I follow this tip and put a small zip loc bag over it. I can use it through the bag, but grime can’t get in to foul up the works.